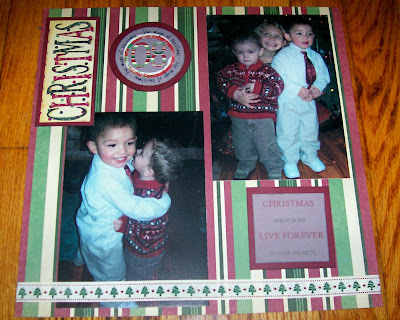 Confessions of a 20-something Scrapbooking Mother: Oh my-3 posts in 1 day!! THANKS BECKY FOR VISITING MY BLOG! I HAVE BEEN SCROLLING AWAY AT YOURS ALL LOVE ALL YOUR CREATIONS & I CANT WAIT TO POP BACK IN & SEE WHAT YOU HAVE BEEN UP TO! Love the ribbon and paper. Very nice layout, Becky. Awwwwww! what cute photos! and the paper and embellishments look just perfect with them! Fantastic layout! I love it!